Have you ever been on a conference call? I am on at least one a week at a minimum. It is not often, if ever, that someone in a workplace looks forward one of these conference calls. If you’ve ever had to do a teleconference — especially an unmoderated call — then you’ll relate to just about every second of this video. If you haven’t had to sit through a teleconference for business, consider yourself lucky and let this be a cautionary tale. This idea is accurately portrayed in a new sketch from comedians Tripp Crosby and Tyler Stanton. 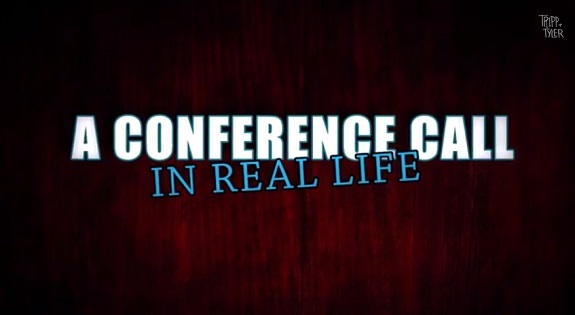 In the video, “A Conference Call in Real Life,” the duo shows what a virtual meeting would look like if the conference process played out with all of the participants in the same room. Crosby and Stanton team up with four other actors for the four-minute YouTube clip. The video starts with Crosby joining the meeting — walking into the room, waiting for the tone, and announcing his name — followed by an operator saying, “…has joined the meeting.” A bit of hold music plays before Beth Pilgreen steps in. Crosby can’t hear Pilgreen announce her name, so he mistakes her for Stanton. It’s a common mistake on conference calls, but to watch it play out as two people sit next to each other is hilarious. It also demonstrates how frustrating these calls can be. But the visualization of conference calls and their downfalls is just getting started. Throughout the rest of the clip, people enter and leave (both the call and the meeting room, for the visuals’ sake), dogs bark, and the wind blows; and at the end, a person that the call leader didn’t even know was there the entire time responds to a statement. >It is obvious YouTube viewers like the piece, as it has over 11,000,0oo views. It will definitely have you laughing — and maybe trying to reschedule that next business call you have planned. Have you been on a conference call like this? Tell us about it in the comments below.